He’s got the skills. He’s got nerves of steel. His reflexes are cat-like. He has a need for speed and a thirst for living life in the danger zone. He wants nothing more than to fly the skies in crazy, daredevil style maneuvers. He even has a Tom Cruise kind of smolder to his look. There’s just one tiny problem. He’s just a toddler. It’s true. They won’t let a toddler join the Top Gun school of piloting, but that doesn’t mean that your child doesn’t have what it takes to be an ace fighter pilot like Maverick. Your little one can start early! He can start honing his skills now. That way, when he’s finally old enough to start flight school class, he’ll already be on the highway to the danger zone! All you need is this officially licensed Top Gun costume for toddlers to get him started. 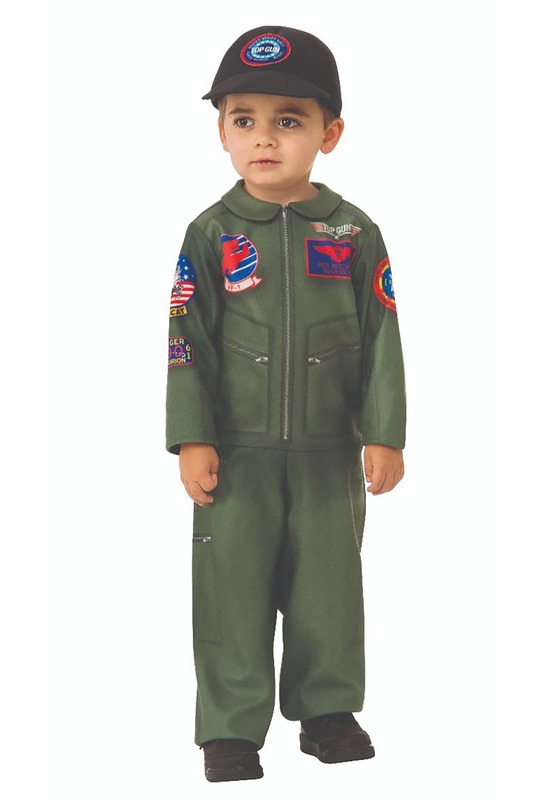 This toddler Top Gun costume is designed to turn your tot into the ace pilot, Maverick. It comes with a dark green jumpsuit that looks like a real flight suit. It has plenty of details in the front, including a Top Gun patch in the front and the call sign tag “Maverick” on the chest. It also has an American Flag on the sleeve and various other logos for an authentic look. It also comes with a hat that has the Top Gun logo on the front to finish off the look of your little pilot. Even though it might be a few more years until your child is eligible for flight school, you can bet that your little Maverick will feel ready for a dogfight when after putting this Top Gun costume on! Be sure to check out our matching adult costumes to make sure that your little one has a wingman for the next mission!